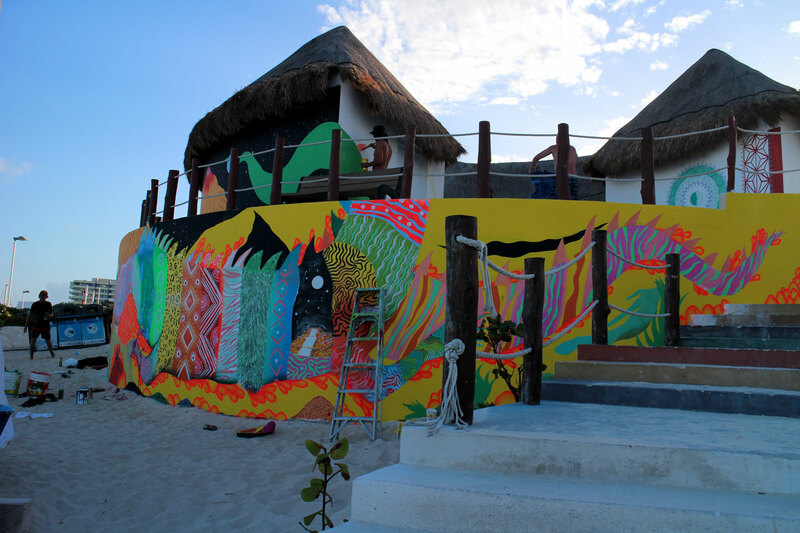 I recently spent a week in Mexico painting a mural with Spencer Keeton Cunningham. 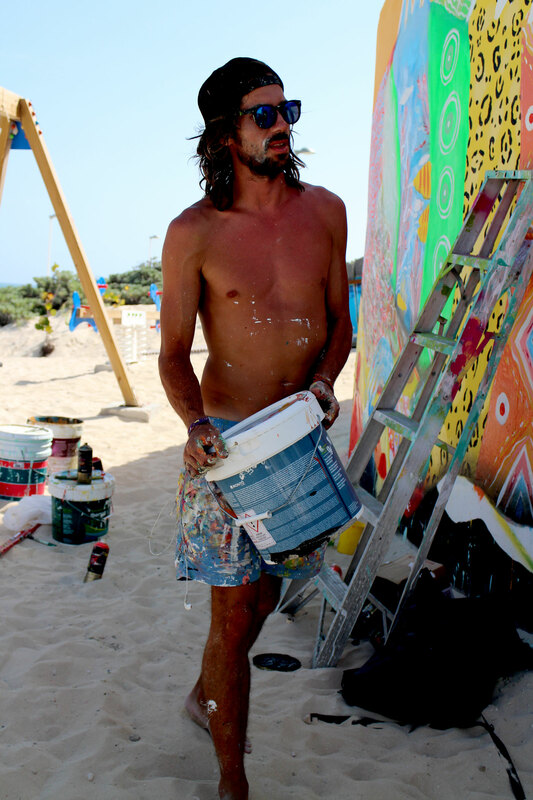 Between painting the wall, painting himself, and posing for photos with tourists, Spencer took the time to answer a few questions about life on the road. 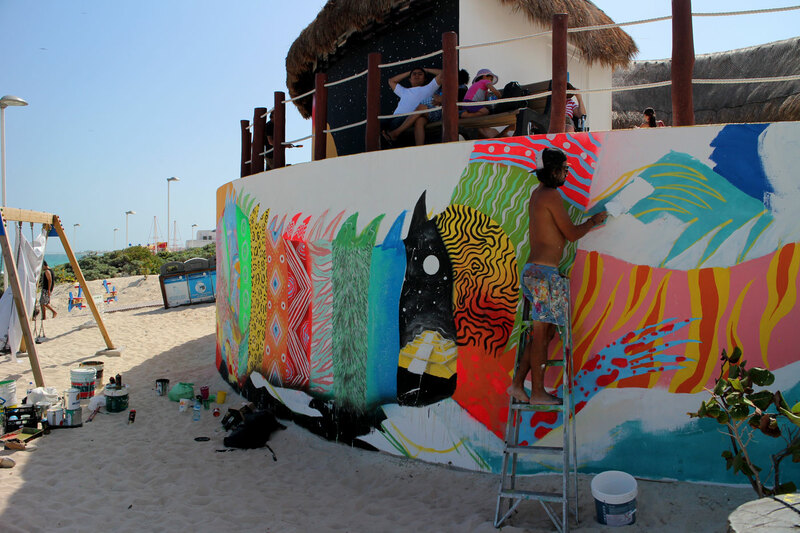 I’m painting a wall with my friend Aaron Glasson in an amazing spot on the beach in Cancun. It’s a sunny day and the oceans about 100 feet away, you could almost skip a rock from here. We had planned to paint a crazy multi-species creature and then when we got here an iguana ran across the sand right in front of the wall. So we’re incorporating some other species to create a kind of strange iguana. What’s been going on so far this year? I have been staying at an artist residency in Mexico City and have painted a couple of walls there. I painted one on the rooftop of a place called MUJAM. It’s a double-headed snake that resembles a face with a skull like nose. I also painted a black and white snake strangling an eagle about to bite it, so kind of the opposite of the Mexican flag. Where were you before Mexico? I’ve been on the road for almost ten months. Before coming to Mexico I drove from New Orleans to Los Angeles and then back to New Orleans, and before that I drove to Alaska from Miami. I have a place in San Francisco I can go back to, but I don’t know when I’m going to be back there. I’ve been on the road non-stop and at the moment I’m unsure when this journey will end. Do you think travel is important to your lifestyle and the way you make art? It can be a hard life sometimes, constantly traveling with no break and no base, you kind of just glide through every town. But the people and the community in every place I travel influence what I paint. Is this an intentional lifestyle? It’s definitely intentional. I’ve been on a long adventure ever since I left San Francisco and went to Cuba. After that my plan was to drive back across the country to San Francisco, but the friend I was traveling with got sick, so I just went off by myself and have been on the road ever since. I don’t know how much longer I can keep this lifestyle up, but we’ll see. What do you think it is about this lifestyle that’s so inspiring? You are in the moment everywhere you go. I get an urge to go somewhere I need or want to go and I just do it, there is nothing holding me back and there are no obligations. How has skateboarding influenced your lifestyle and your work? Skateboarding is something I’ve been doing since I was a kid. I got my first skateboard in 1987 and I haven’t stopped since. I feel the need to put skateboarding in my art because it is something I’m doing all the time. Some friends and I are involved in a project donating boards to skaters in Cuba. It’s a cool project, my Cuban friends are surviving on a tiny amount of money every month so a skateboard for them is really unattainable. I was born in Washington state and I grew up in Portland and on the road with my brothers in a little blue van. I was driving through the Yukon on my way back from Alaska and I saw a wild red fox near the road. I stopped the car and ended up hanging out for over two hours and becoming good friends with him. That same day I saw some wild buffalo and found the biggest hot spring I have ever seen. That was one of the best days of my life.